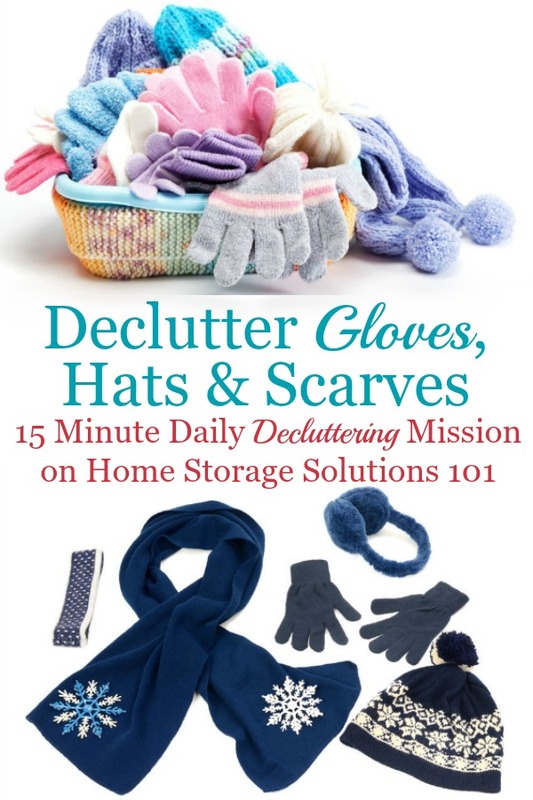 Today's mission is to declutter your wardrobe of gloves, hats, scarves and other cold weather accessories that you don't need and are excess stuff, to get rid of your closet or drawer clutter. This mission is designed to be done while we're focused on the Entryway & Mudroom Organization Challenge, because that is often where these types of winter gear and accessories are located, because family members and guests take them off as soon as they come inside from the cold. 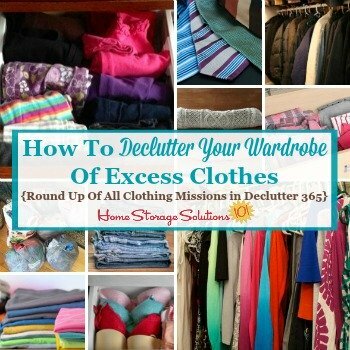 Of course, this mission could also apply to one of several other different weeks of the 52 Week Organized Home Challenge, all dealing in one degree or another with clothes, including the Organize Master Bedroom Closet Challenge, the Organize Master Bedroom Challenge, or the Outgrown & Seasonal Clothing Storage Challenge. You can also get rid of any other excess or unneeded items of clothing or gear for other weather events as well, such as umbrellas, as well. Remember that yesterday's mission was to declutter excess coats and jackets, and we've also had missions for decluttering shoes and boots, some of which may also have been used for specific types of weather conditions. How Many Pairs Of Gloves, Scarves & Hats Do You Need? Today's the day that you ask yourself how many of these cold weather accessories you need (and have room for in your closet or drawers), and then keep decluttering until you reach that number. Since everyone has their own lifestyle, fashion and style sense, and a different amount of space in their closet and drawers to store this type of clothing it's difficult to say with certainty what that number of how many you need is, for you. Therefore, I find it easier to talk about minimums, and then additional factors to consider to decide if you need or want any number above that minimum. At a minimum you need enough of this winter gear to keep each member of your household warm in the climate you live in, and to be able to have clean items until the next time you do laundry, during the cool weather months. As discussed in more length in my article about how often to wash various types of laundry, assuming you've just worn the clothes as expected, and not fallen in a mud puddle or otherwise made big mess, you can wash these types of items about once a month (perhaps more frequently for kids, if they're very active outside). That means you don't need to wash this stuff too frequently, which means on a practical and totally utilitarian level we don't need many of these items per person. 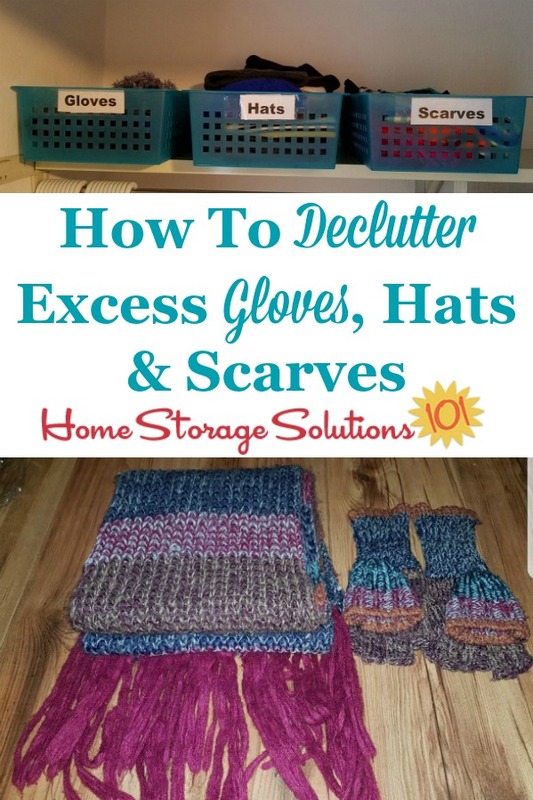 Perhaps one set for each family member, with a few extra back ups that anyone in the household could use if they somehow lost or misplaced their own gloves, scarves or winter hats. However, most people use other considerations, that aren't utiliatarian, to decide they'd like a few more of these items. Here are some things to decide for yourself, when determining how many of these items you'll want to keep. 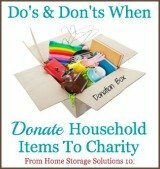 Keep decluttering to get rid of excess items that you haven't worn in the past year, don't fit your body, you don't like, aren't in fashion, have too many stains or tears to be salvageable, no longer have a match or pair, or otherwise will not fit into the space you've got designated for them. 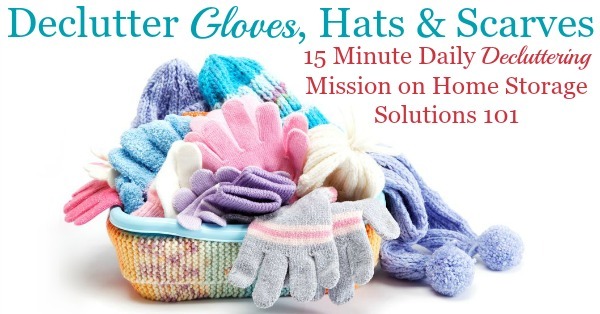 Because most people need two gloves, for example, and gloves are easily lost or misplaced, it's easy to understand why during this mission you may realize instead of getting rid of winter accessories, you need to get more for people in your household. That's perfectly OK! If you realize now, before it gets too cold, that your child, for example, needs a new pair of gloves, it's easy to get it onto the shopping list and pick them up soon, without stress or undue inconvenience. If, on the other hand, you didn't take a quick mental inventory of everyone's winter gear now, on the first really cold day of the season you might have to scramble to find something for your child to wear, so they don't get too cold while standing by the bus stop. Therefore, use this mission as an opportunity to make sure everyone has what they need to keep warm during the upcoming winter, to save yourself some stress and extra effort later. This is typically a pretty quick mission to accomplish, but it will really improve your whole family's day to day life in the cold weather, once you've done it. Here are some photos from readers, below, who've already done this mission to show you what they accomplished, and also to get you motivated to tackle this task for yourself today. The top photo within the above collage was sent in by a Declutter 365 participant, Linda, who said, "Got rid of gloves with no mates and those items we never wear." The bottom photo of the collage was sent in by another reader, Emma, who said, "This is one of 20 scarves I got rid of :)." I hope these instructions have inspired you to get rid of your winter gear and accessories clutter, so your wardrobe and closet contain only the items that you love, and look and feel good on you.